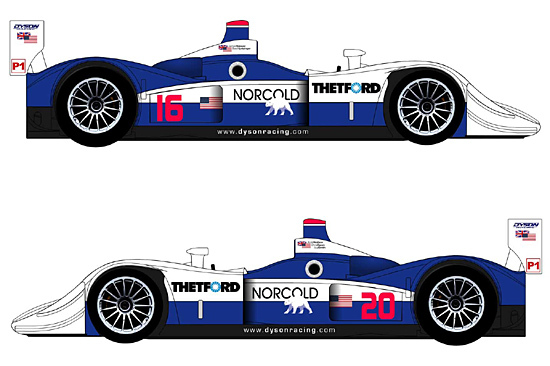 Dyson Racing has been a fixture in sports car racing in North America for over three decades. Over the years, the team has won the 24 Hours of Daytona twice, and many other races, including the driver’s title for Elliott Forbes-Robinson in the ALMS’ inaugural season. Over the past three years this has been the team that has pushed – and sometimes defeated – the best in the world, Champion Racing and its Audi R8. In the process, Dyson Racing again demonstrated why it has always been among those few teams at the pinnacle of sports car racing. In 2006, Dyson Racing debuts an entirely new and exciting Lola B06/10, powered by Advanced Engine Research’s Twin Turbo V8. dailysportscar will be bringing you reports from each of the team’s American Le Mans Series events, along with other special features throughout the season. The first of these, an overview of the new car and engine, launches our special coverage, less than a week before the first outing at Sebring’s “Wheels Down Winter Test,” January 23-25. We hope you come back here for Dyson Racing coverage throughout the season. Lola Cars International has a long and storied history as a constructor of some of history’s great race cars, punctuated recently by the re-introduction of a beautiful classic, the Lola T70 of the late 1960s. The rookie season of the company’s “new rules” Le Mans Prototype 2 (LMP2), the B05/40, was singularly successful for a new design, combining both speed and reliability to win driver and team championships in both the American Le Mans series and the Le Mans Endurance Series in 2005. The similarity of the LMP2 rules to those for the larger, more powerful Le Mans Prototype 1 (LMP1) machines augers will for the success of the new Dyson Racing prototype. The Dyson crew is more than a little familiar with Lola prototypes, of course, having raced the B01/60, first as an LMP675, then as an LMP1, in the ALMS over the past three seasons. Originally designed for a “lighter” class, that Lola was a speed, but not a “thoroughness” match for the tank-like Audi R8. 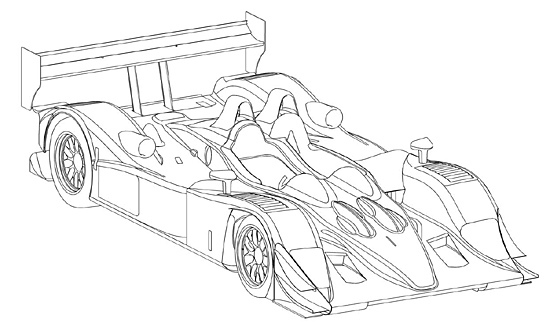 While it benefits from the development of last season’s B05/40, the B06/10 (below) is specifically designed for the new Automobile Club de l’Ouest LMP1 prototype rules. By mid-November, when the tub passed FIA crash testing, the new car’s aero design had already logged 260 hours in Lola’s own Composite Tooling and Structures, Ltd., wind tunnel, which produces wind speeds of 145 mph. A similar amount of testing of the B05/40, plus a season of “on-track” experience, certainly further contributed to the knowledge of Lola aerodynamicist Phil Tiller (who runs the design team’s Computational Fluid Dynamics simulations) and Composites Manager Craig Turner. The Chief Designer of the Lola B06/10 is Julian Sole, who has spent his considerable career with Lola, and set out – in contrast to the B01/60 – to build a customer car. As Head of Engineering Julian Cooper told dsc about the B05/40 last year, and the difference is substantial. We can expect significantly improved reliability in Dyson Racing’s new Lola. The minimum regulation weight is 925 kg. This will be the target weight for the complete car. The chassis is constructed from carbon fibre in one piece, with symmetrical twin rollover hoops. The bodywork is all new for the revised aero regulations introduced for 2004. Construction is pre-preg carbon fibre with honeycomb core in order to stiffen the panels. The rear wing and underbody are also of lightweight carbon composite construction. The front and rear uprights are fabricated from aircraft spec steel and TIG welded. Both front and rear suspension use double fabricated steel wishbones with pushrods. Lola 6 speed manual sequential units based on proven Champcar and LMP675 technology. Lightweight magnesium main case casting. Two headlights housed in the nose section plus indicators, two rear red brake lights. ATL fuel cell capacity is 90 litres. Regulation fuel capacity is achieved by fitting fuel displacement balls if necessary. Advanced Engine Research (AER) will provide the power for Dyson Racing in 2006, as has for the last three years. But, as with the Lola chassis, there is a significant difference. To produce this V8, AER started with not only a “clean sheet of paper,” but with the additional experience from personnel from F1. What (or who) they added to their already considerable skills were Chief Engineer Ian Prosser, who has been in charge of “above decks” (heads and valve train) design of the engine, and Oliver Allen, responsible for “below decks,” (crankshaft, etc. ), and recently appointed AER’s Technical Director. 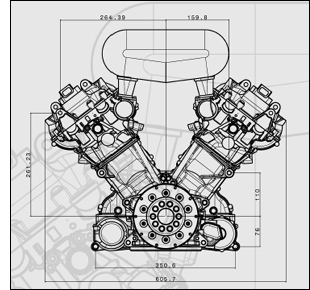 Ian had responsibility (in F1) for port and combustion chamber design, and, strangely enough, for the cylinder head of a racing diesel engine. Oliver was in charge of piston/con rod assembly and pump design with his former employer. Both, having worked on Ilmor’s CART engine programmes, and along with AER’s already talented staff, have no small amount of turbo engine experience either. With this augmentation, AER set out to design the “sports car racing engine of the future.” Well, the future is now, as Dyson Racing will fire up the engine at Sebring’s Wheels Down Winter Test within a few days’ time. The keys to that design have been minimizing parasitic losses, improving combustion efficiency, and reducing internal friction losses. 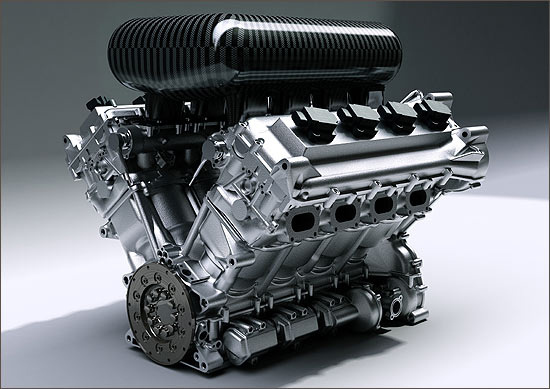 The result is the smallest and lightest sports car racing engine ever. 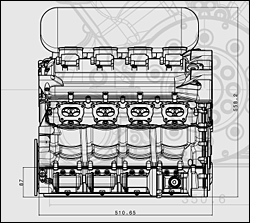 A conservative approach means the engine will be introduced initially without it, but the design contemplates the use of gasoline direct injection (pioneered by Audi’s R8) after the engine has “gotten its legs,” and been sorted in traditional indirect injection form. The AER P32 Twin Turbo V8 is designed specifically to meet ACO/ LMP1 class requirements at Le Mans, and to be used in the Le Mans Series and the American Le Mans Series. So Dyson Racing comes to the 2006 American Le Mans Series campaign armed with the best hardware available in the world of sports car racing. We’ll see the first results of that at Sebring’s Wheels Down Winter Test, and we’ll bring you a report of those results – after a break for the team’s outing in its Crawford Prototype at Daytona.